The Smokies’ pitching was outstanding last night as they completely shut down the Biscuits allowing only three hits en route a 4-0 victory. Maybe more impressive was their approach, they walked ten times last night, clearly they have been watching the Major League club. Jacob Hannemann got things going from the lead-off spot; he went 1-for-4 with a walk, and his sixth stolen base of the season. Chesny Young was 1-for-3 with two walks, and two stolen bases in the win. Bijan Rademacher continued his hot start; he was 1-for-2 with a walk, two runs scored, and he had an outfield assist. Rademacher is now hitting .444 on the season. Carlos Penalver had another solid game; he was 2-for-3 with a double, three RBI’s, and a walk. Paul Blackburn turned in a brilliant start to pick up his second win of the season; he worked seven scoreless innings, giving up three hits while walking three, and striking out three. Corey Black was solid in relief; he worked a scoreless inning while walking one, and striking out one. Andury Acevedo worked a strong ninth inning; he allowed one but also struck out the side. Myrtle Beach built a 6-1 lead in the seventh thanks to a huge night from Ian Happ, and hung on to beat Winston-Salem 6-4. Rashad Crawford is having quite the season; he went 2-for-3 with his second triple of the year, and a run scored. It was the Ian Happ show in this one; he went 4-for-5 with two homers, four RBI’s, two runs scored, and a stolen base. Gleyber Torres, Yasiel Balaguert, Jason Vosler, and Charcer Burks all finished the night with one hit each. Tommy Thorpe got the start tonight, and picked up his first win of the season; he worked 5.1 innings, giving up one run on five hits while walking two, and striking out two. Daury Torrez struggled in this one; he worked 1.2 innings, giving up three runs, two earned, on five hits while striking out two. David Berg was terrific out of the pen to pick up his second save of the season; he worked two scoreless/hitless innings while striking out one. A huge fourth inning saw the South Bend Cubs plate six runs to break open a 2-2 game on their way to a 9-3 drubbing of Bowling Green. Every single player in the lineup for the Cubs had at least one hit as they pounded out thirteen in the win. J. Higgins went 2-for-5 with his third double of the season, two RBI’s, and a run scored. Donnie Dewees went 1-for-4 with a walk, two RBI’s, a run scored, and his fourth stolen base of the season. Eloy Jimenez went 1-for-4 with his third double of the season, a walk, and an RBI. Daniel Spingola had a huge night; he went 3-for-5 with two stolen bases, and a run scored, he’s now hitting .357 on the season. Matt Rose chipped in with some power; he went 1-for-4 with his first homer of the year, two RBI’s, and a run scored. Andrew Ely went 2-for-4 with a run scored in the win. Carson Sands struggled early, but settled in to pick up his first win of the year. Sands worked five innings, giving up two runs on five hits while walking one, and striking out two. John Williamson was brilliant in relief; he worked two scoreless/hitless innings while walking one, and striking out three. Greyfer Eregua cleaned things up; he worked two innings, giving up one run on two hits while striking out two. A rough opening week for the Iowa Cubs didn’t get any easier yesterday as they lost their fourth straight game to Round Rock, 10-4. Round Rock is stacked, and they are going to win a lot of games this year, unfortunately Iowa had to be their first victim. John Andreoli went 1-for-4 with a walk, and two RBI’s in the loss. Dan Vogelbach continued his sold start; he was 1-for-4 with two RBI’s. Kristopher Negron finished the day 2-for-4 with a run scored, he is now hitting .333 on the season. Drew Rucinski battled in this one; he registered a quality start, but also the loss. He worked six innings, giving up three runs on five hits while walking one, and striking out six. 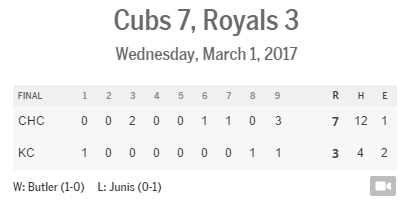 Brandon Gomes kept the Cubs close as he worked a scoreless inning in relief; he gave up one hit while walking one. C.J. Riefenhauser was massacred in this one, he worked just 1/3rd of an inning, giving up six runs on four hits while walking two, and striking out one. Jean Machi was also roughed up; he worked 2/3rd of an inning, giving up one run on two hits while walking one, and striking out two. Spencer Patton was a bright spot as he worked a scoreless inning, striking out the side while doing so. Another rough go of it for the Smokies’ offense in this one, unfortunately their pitching couldn’t completely shut down Mobile like they did the night before. Tennessee had to settle for a four game split after falling 4-1. Chesny Young had one of the four hits by the Smokies on Sunday; he finished the day 1-for-4 and is now hitting .417 on the season. Taylor Davis was 1-for-3 in the loss. David Freitas has had a great start to the season; he finished yesterday 1-for-2 with a walk, and a run scored. Tyler Skulina got the start and was fantastic; unfortunately he picked up the hard luck loss. He worked six innings, giving up one run on four hits while walking one, and striking out three. Starling Peralta couldn’t keep things close as he worked two innings, giving up three runs on three hits while walking one, and striking out one. David Garner was solid out of the pen, he worked a scoreless inning giving up one hit while walking one, and striking out three. Myrtle Beach evened their 2016 record at two on Sunday as they outlasted the Frederick Keys in a 7-5 victory. A big three run seventh inning put the game out of reach despite a late push by Frederick to make things close. Ian Happ went 1-for-4 with his first triple of the season, an RBI, and a run scored. Yasiel Balaguert had a huge day; he went 3-for-4 with an RBI, and two runs scored. Jason Volser was 1-for-3 with his first double of the season, a walk, an RBI, and a run scored. Shawon Dunston Jr. came up with a huge hit in this one; he finished the day 2-for-4 with his first triple of the year, and three RBI’s. Erick Leal wasn’t so sharp, but was able to pitch well enough to pick up the win. Leal worked five innings, giving up three runs on five hits while walking two, and striking out two. Jordan Minch was stellar out of the pen; he worked two scoreless innings, giving up one hit while walking two, and striking out two. Daury Torrez was roughed up a bit; he worked 1.2 innings, giving up two runs on four hits while walking two, and striking out one. Jose Rosario picked up his first save of the season by recording just one out. South Bend was snowed out.